Now Income tax site change the procedure to Register Digital Signature online. In view of Error on loading of Java on users computers, because of this Income Tax change the procedure to register Digital signature through offline mode. Income Tax provide a java utility for generate offline Digital Signature file without Internet on your system. So let we know what is the process and how it works? If you want to register Digital Signature for company you need to enter Authorized Person PAN in field "Enter PAN of the DSC" and you must have digital signature of Authorized Person. After Enter PAN Select type of your Digital Signature. 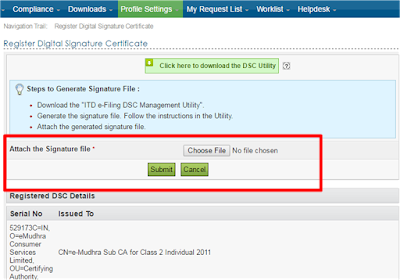 Name of the person whose Digital signature want to register on income tax site appear on section "Select USB Token Certificate", select this and click on generate signature file. A Signature file will generated by Java Utility. You have to save this file on your desktop or anywhere in system. Now login to your income tax account and go to Profile Setting tax and then click on Register Digital Signature. Income Tax site ask you to attach digital signature file. Select digital signature file which was generated by Java Utility and click on submit. Its done! your digital signature is now register on Income Tax Website and a message appear on your screen for successfully registration of your digital signature.